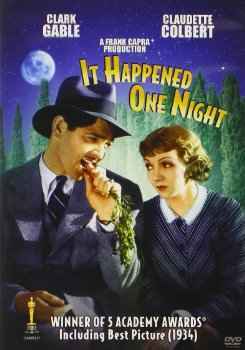 It Happened One Night (1934) - one of my all-time favorite comedies, it has Clark Gable as a recently fired reporter and Claudette Colbert as a runaway heiress. We watched this as a family recently and my tween and my older teen loved it too. Really a timeless classic. Be sure to catch the scene that inspired the creation of Bugs Bunny. Directed by Frank Capra, it was adapted from the short story "Night Bus" by Samuel Hopkins Adams. Special mention from the same decade, Gone With The Wind (1939) with a totally different side of Clark Gable and British actress Vivian Leigh as the Southern belle Scarlett O'Hara. A sweeping historical epic based on Margaret Mitchell's doorstop of a book, I don't think of it as a romance but it usually tops the list of romantic movies. I can't mention romantic sweeping historical epics based on doorstops books without giving a shout out to Outlander. It's a series on Starz, rather than a movie, and it's rather steamy, but it's a good adaptation of the book so far. If you are in a Jane Austen mood, I'll have to go with Sense and Sensibility (1995) with Emma Thompson, followed by Pride and Prejudice (2005) with Keira Knightly. Although I'm really torn on the latter, if you're ok with a longer viewing instead, it's hard to beat Colin Firth as Darcy in the 1995 BBC mini-series version of Pride and Prejudice. If you are in a romantic comedy sort of Jane Austen mood, then either try Bride and Prejudice (2004) as this Bollywood musical is hilarious), the underrated Northanger Abbey (2007) from BBC in which Austen's dry humor comes through, or Clueless (1995) where Alicia Silverstone plays a Beverly Hills Emma. For the zombie fans, I guess Pride and Prejudice and Zombies might be the date night movie this weekend. If you are determined to stay in, Warm Bodies is cute and funny, and gets you in the zombie mood for The Walking Dead's return this Sunday. P.S. Now might be a good time for a reminder that you can get a free 30-day trial of Amazon Prime have access to their streaming library of movies and music, on top of free 2-day shipping.